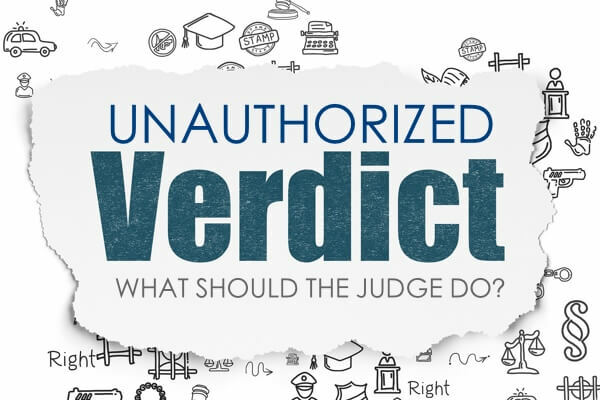 Can a Judge Grant Deferred Adjudication After a Jury’s Guilty Verdict? The Court of Criminal Appeals recently handed down an opinion on a petition for writ of mandamus. The two issues facing the court were (1) the nature of a misdemeanor trial after a defendant pleads guilty to a jury; and, (2) whether a trial court has the ability to defer an adjudication of guilt after a jury finds a defendant guilty. The Court of Criminal Appeals declined to grant mandamus relief on the first issue but, for the reasons discussed below, it granted mandamus relief for the second issue. Majority Opinion: In re State ex rel. Mau, (Tex. Crim. App. 2018). The Facts—The Trial Court Instructed the Jury to Return a Verdict of Guilty and Then Entered an Order Deferring Guilt. The underlying case involved a defendant who was charged with the misdemeanor offense of assault bodily injury of a family member. The defendant did not waive his right to a jury trial for this offense, and the State never gave written consent to waive a jury trial. As a result, the case proceeded to a jury trial upon the defendant’s plea of not guilty. During trial, however, the defendant changed his plea to guilty, and the trial court retired the jury with an instruction that it return a verdict of guilty on the basis of the defendant’s plea, and it did. After the defendant was found guilty, the trial court did not submit the issue of punishment to the jury. Instead, it dismissed the jury. There were no objections to the jury’s dismissal. However, the State did bring to the court’s attention that the defendant had not been properly admonished prior to pleading guilty. At that point, the court admonished the defendant without objection. Only at this point—after the jury had already returned a verdict of guilty—did the defendant waive his right to jury trial. The State, however, never consented in writing, before the entry of the guilty plea, as required by Article 1.13 of the Code of Criminal Procedure. As a result, when the trial court deferred guilt, the state sought a writ of mandamus. The State argued to the court of appeals that the trial court lacked the authority to defer the adjudication of the defendant’s guilt, and the court of appeals denied relief. After being denied, the State, again, sought mandamus relief with the Court of Criminal Appeals. Court of Criminal Appeals Granted Mandamus Relief—Holding the Trial Court Was Without Authority to Enter an Order of Deferred Adjudication. In its argument to the Court of Criminal Appeals, the State maintained that the trial court lacked authority to defer guilt and argued that the trial court had a ministerial duty to enter judgment on the jury’s verdict. 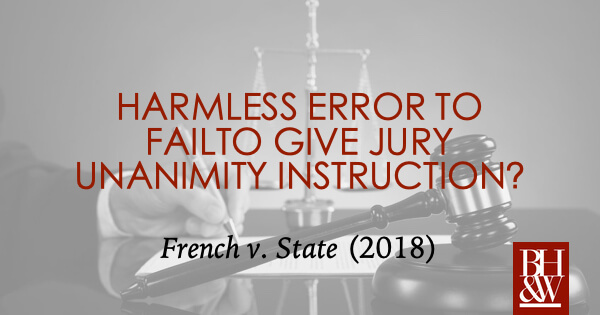 The State explained that by allowing the trial court to defer the defendant’s guilt, after the jury had rendered its verdict, would essentially nullify their statutory discretion to consent to a jury waiver. In maintaining its position, the trial court relied on a court of appeals opinion, State v. Sosa, 830 S.W.2d 204 (Tex. App.—San Antonio 1992, pet. ref’d). The issue in Sosa was whether the judge, having found the defendant guilty on his plea of not guilty in a bench trial, could thereafter withdraw the courts finding of guilt and assess deferred adjudication. The Court of Criminal Appeals allowed this because there was no authority that barred the trial judge’s discretion or the procedure in a bench trial. However, the Court of Criminal Appeals explained that the same could not be said about a jury’s verdict of guilty. Here, at the time that the defendant pled guilty to the jury, he did not waive his right to a jury trial nor did the State consent to a waiver. Without such a waiver, the trial court was bound to resolve the issue of guilt by a jury trial and, further, the trial court then had a ministerial duty to enter judgment on the jury’s verdict. As a result, the Court of Criminal Appeals granted mandamus relief. While a defendant can always change his or her plea, the trial court cannot abrogate a jury’s finding of guilt by placing a defendant on deferred adjudication. At this point in the trial, the only way to defer guilt would be to grant a motion for new trial. However, this motion for new trial must have a legal basis, and deferred adjudication, alone, is insufficient. 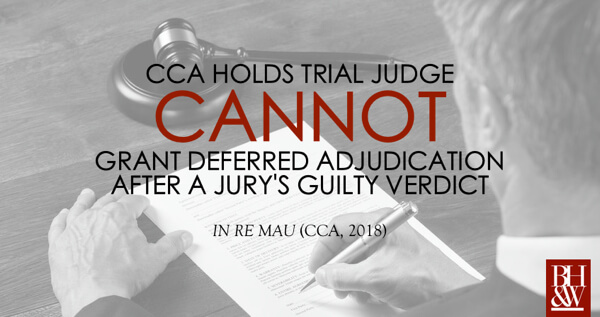 However, a defendant may be placed on deferred adjudication after a jury trial has begun, but before a verdict has been returned if the defendant properly submits to the court, a waiver of his or her right to a jury trial, and the State agrees accordingly. The State may consent, at any time, but the consent must be in writing and filed appropriately. If the defendant waives this right and the State follows the aforementioned steps, then the judge can dismiss the jury, accept the defendant’s plea, and subsequently place the defendant on deferred adjudication. Alcala, J., filed a concurring opinion. Newell, J., filed a concurring opinion. The Court of Criminal Appeals recently handed down an opinion regarding whether a jury can informally acquit based on a unanimous jury note. The issue facing the court was whether a jury note, which provided the jury’s voting breakdown of the charged offense and the lesser included offense, could be considered an acquittal for double jeopardy purposes even though a mistrial was later declared because the jury could not reach a unanimous decision. 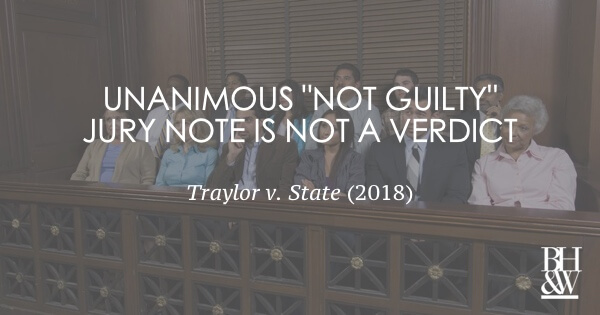 Traylor v. State, (Court of Criminal Appeals, 2018). The Facts—The Trial Court Declared a Mistrial After Unanimous Jury Note. Appellant was on trial for first-degree burglary of a habitation. At the conclusion of his trial, the jury was charged with determining whether Appellant was guilty of first-degree burglary, the charged offense, or second-degree burglary, a lesser-included offense. 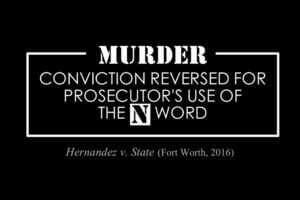 The difference between the two offenses is that the jury did not have to find that Appellant used a deadly weapon in order to convict him of the lesser included offense. During deliberations the jury sent out a note stating that it unanimously agreed that Appellant was not guilty of the charged offense but indicated they were deadlocked (5-7) on the issue of guilt for the lesser-included offense. The trial court instructed the jury to keep deliberating before ultimately declaring a mistrial because the jury claimed they still could not reach a unanimous verdict. Appellant was later re-tried and convicted of first-degree burglary. Appellant appealed this verdict, arguing that the trial court abused its discretion by granting a mistrial without a manifest necessity, and therefore, creating a double jeopardy violation. The Court of Appeals Agreed with Appellant—Holding Appellant’s Subsequent Trial for First-Degree Burglary Was Barred Because The Jury’s Note Amounted to an Acquittal. In agreeing with Appellant, the Court of Appeals cited United States Supreme Court decision, Blueford v. Arkansas, 566 U.S. 599 (2012). The Court of Appeals held the facts in Appellant’s case to be significantly distinguishable from Blueford; thus, warranting an acquittal. The Court of Criminal Appeals, however, disagreed and reversed for the reasons discussed below. Double Jeopardy protects individuals from multiple prosecutions for the same offense. However, a trial may be ended without barring a subsequent prosecution for the same offense when “particular circumstances manifest a necessity” to declare a mistrial. Such circumstances include a jury’s inability to reach a verdict. For a jury note regarding the jury’s inability to reach a verdict to bar a subsequent prosecution, there must be some indication that the jury had “finally resolved” to acquit the defendant. Here, the Court of Criminal Appeals held that the jury’s note also lacked the “finality necessary to constitute an acquittal” on the charged offense. The Court of Criminal appeals reasoned that the jury note lacked finality because the jury continued deliberating after the unanimous vote count and there was no indication that the vote on the charged offense remained unanimous throughout deliberations. 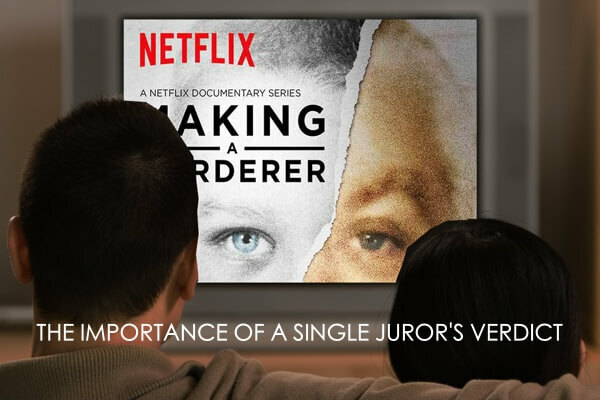 Furthermore, the jury never filled out the Court’s verdict forms because, as reported by the jury, they still had “no decision.” Thus, while there are circumstances in which a jury can informally acquit a defendant, the facts in this case do not warrant an acquittal. 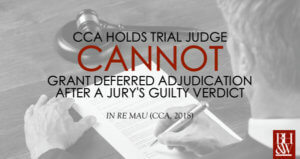 TAKEAWAY: It appears that the CCA might have come down differently if the jury had returned a 2nd note stating that they were still unanimous that the defendant was not guilty of the greater offense after all deliberations, or if the jury had signed the verdict form indicating such, even if there was ultimately no verdict. If you are faced with a similar circumstance, before the judge declares a mistrial, try to find a way to pin the jury down so that you can use it later if the state decides to try the case a second time. Can One Spouse be Forced to Testify Against the Other? Can My Spouse be Forced to Testify Against Me in a Criminal Trial in Texas? Everyone knows (or should know) of the attorney-client privilege which prohibits the calling of an attorney to testify as a witness against his client and protects the attorney-client relationship. But what about the husband-wife relationship? Are spouses afforded any protection from having their spouse testify against them in a criminal trial? Yes. In Texas there are two “Husband-Wife” privileges that apply to the marital relationship: spousal immunity and the marital communication privilege. Many people are aware that certain privileges arise but often do not know exactly what protections these privileges provide. The following article discusses both of the matrimonial privileges in Texas. What is Spousal Immunity? How does Spousal Immunity work in Texas? Spousal immunity is the privilege that exists in a criminal trial for the defendant’s spouse not to be called as a witness in certain situations. Tex. R. Evid. 504(b). This privilege applies to spouses that are married to the defendant during trial and are asked to testify as to matters that occurred during the spouse’s marriage to the defendant. The non-defendant spouse holds this privilege; meaning he or she is the one who may invoke the privilege not to testify and it is ultimately his or her decision. Tex. R. Evid. 504(b)(3). Thus, if the spouse wants to voluntarily testify for the State, she may do so regardless of whether the defendant objects to the spouse’s testimony. Spousal immunity does not stop the defendant from calling their current spouse as a witness. If a defendant chooses to do so the spouse cannot assert this privilege and will be required to testify. With that, if the defendant does not call the spouse and surrounding evidence suggests the spouse could testify to relevant matters the State is allowed to comment about that. 504(b)(2). There are two exceptions to spousal immunity in Texas. First, the privilege does not apply in a criminal proceeding in which the defendant has committed against the spouse (e.g. Domestic Violence) or prosecution for bigamy. Second, the privilege does not apply when the spouse is called to testify about matters that occurred before they were married to the defendant. 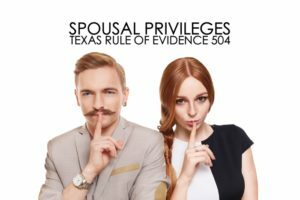 What is the Texas Marital Communication Privilege? Under Texas Rule of Evidence 504(a), spouses have the privilege to prevent testimony of certain communications made during the marriage from one spouse to the other spouse. Unlike the spousal immunity privilege, the marital communication privilege may be invoked by either the defendant or the spouse being called as a witness. Additionally, this privilege survives divorce; meaning it applies whether or not the defendant and the spouse are still married as long as the communications were made while they were married. Tex. R. Evid. 504(a)(2). This privilege only applies to communications that were intended to be confidential, that is, they were made privately with no intent to disclose to anyone other than the spouse. A communication will still be confidential if someone overheard the conversation if the defendant spouse made the statement without knowledge or intent that the other person would hear the conversation. Basically, the requirement is that the communication made was intended for the spouse’s ears only. There are two exceptions to the confidential communications privilege. First, if the communication was made in whole or in part to aid in the commission of a crime the privilege does not apply. Second, the marital communication privilege does not apply in prosecutions for crimes against the defendant’s spouse, any minor child, or a member of the defendant or defendant spouse’s household. In conclusion, there are certain situations where matters occurring between spouses are kept within the sanctity of the marriage and will not come out in court. However, as you can see these privileges are very specific and it is important to be aware of what exactly is privileged and when such privileges apply. 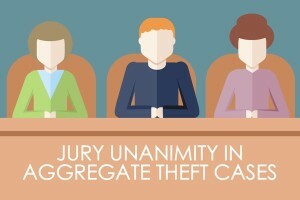 What is Jury Unanimity for Aggregate Theft Cases? 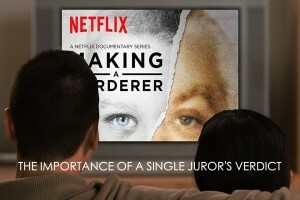 Jury unanimity is required in every jury trial, whether it be felony or misdemeanor. This means that the jury must unanimously agree that the State has proven or failed to prove all elements of an offense beyond a reasonable doubt. If a jury cannot reach a unanimous verdict of guilty or not guilty, then the judge will declare a mistrial. With some offenses, however, it can be a little unclear as to what jury unanimity actually requires. This is specifically so with aggregated theft cases. Aggregate theft is an offense where two or more thefts were committed “pursuant to one scheme or continuing course of conduct” and the amounts combined determine the grade of the offense. Tex. Penal Code §31.09. Under Section 31.09, aggregate theft may be and often is considered as one offense. Even though it is considered one offense, each individual underlying theft act (where the amounts are aggregated) is considered an element. 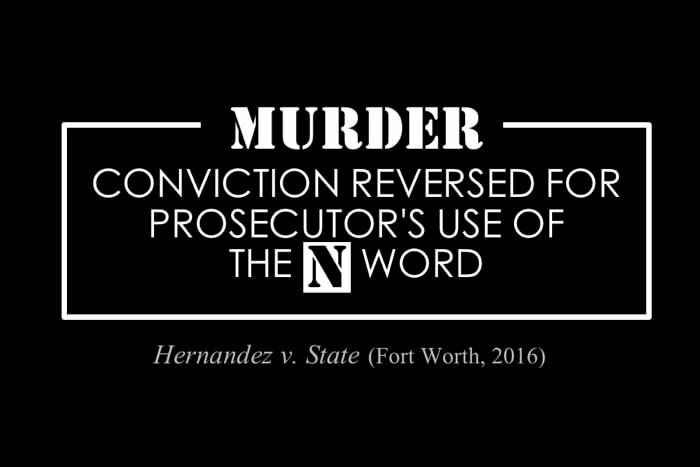 The Court of Criminal Appeals of Texas has held that for evidence to be sufficient the state must prove beyond a reasonable doubt that the defendant unlawfully appropriated “enough property to meet the aggregated value alleged.” The state is not required to prove each underlying appropriation. However, the Court, until recently has left one question unanswered: Does the jury have to unanimously agree on all underlying theft transactions? Meaning, if the defendant is alleged to have committed 10 separate theft acts (pursuant to a common scheme), do the jury have to agree on each, or some, or none? Kent v. State—What is the Jury Unanimity requirement in Aggregate Theft cases? Until recently there had been no holding by the Court of Criminal Appeals of Texas on whether jurors are required to unanimously agree on each underlying transaction that is used to comprise an aggregated theft charge. In Kent v. State the Court finally addressed this exact question. See the full CCA opinion in Kent..
Kent was a mortgage broker indicted for theft from four complainants in an amount exceeding $200,000. The thefts were alleged to have occurred over a period of time and pursuant to one scheme or continuing course of conduct. At trial, the defense requested a paragraph in the jury instructions that outlined each individual theft allegation and called for a unanimous verdict on each. The trial judge denied the defense request to include this paragraph. The jury found Kent guilty of aggregate theft. On appeal, the Kent complained that the trial judge erred by refusing to include his requested paragraph in the jury instructions. The appellate court reversed and remanded the case for a new trial, holding that the jury should have been instructed that they must unanimously agree beyond a reasonable doubt on each underlying transaction used to comprise an aggregate theft charge. unanimity requires that the jurors agree that the threshold amount has been reached and that all the elements are proven for each specific instance of theft that the individual juror believes to have occurred. Every instance of theft need not be unanimously agreed upon by the jury. In other words, it is only required that the jurors unanimously agree that two or more thefts pursuant to a common scheme, when combined, exceeded the threshold amount beyond a reasonable doubt, not that they unanimously agree on exactly which thefts were comprised to reach that amount. Takeaway: When facing aggregated theft charges it is important to know that the jury does not have to unanimously agree that each underlying theft alleged in the indictment has been proven beyond a reasonable doubt. Bottom line, it’s the aggregated amount that matters. This is only a brief explanation of how the jury unanimity requirement plays a role in a case and if you should have any more questions contact our Fort Worth criminal defense team. 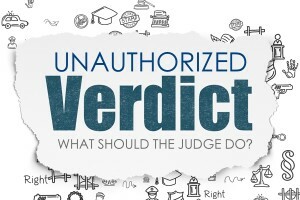 What Should the Trial Judge Do When the Jury Returns an Unauthorized Verdict? At the trial of Reginald Nixon for burglary of a habitation and evading arrest, the jury returned a guilty verdict and sentence of 7 years for the burglary and 9 years for the evading. However, the verdict form contained a handwritten note that read: “*To be served consecutively, not concurrently.” A consecutive sentence would mean that the two verdicts are added together to make the actual prison term 16 years. The jury had previously asked the judge whether the sentences would run concurrently and the judge refused to answer them, advising them to simply continue with their deliberations. 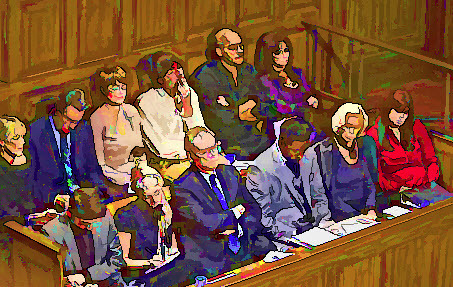 Without an answer to their question, the jury took the matter into their own hands. The problem with the jury’s verdict of 7 years and 9 years to run consecutively is that it is not an authorized sentence. Under Texas law, the sentences in Nixon’s case were required to run concurrently rather than consecutively. As a result, the trial judge refused to accept the sentences and reform them to run concurrently (as he was urged to do by Nixon’s counsel). Instead, the judge sent the jury back with a note advising them that the sentences cannot run consecutively. The jury soon returned with new verdicts of 16 years confinement for each offense, which the judge accepted. If the jury assesses punishment in a case and in the verdict assesses both punishment that is authorized by law for the offense and punishment that is not authorized by law for the offense, the court shall reform the verdict to show the punishment authorized by law and to omit the punishment not authorized by law. CCA explained that the lower court’s reliance on Muniz was misplaced since Section 37.10(b) was not enacted at the time Muniz was decided. Further, the verdict form in Muniz was incomplete, unlike the verdict in this case, which was complete but contained an unauthorized portion. Although the terms of confinement were 45 authorized punishments, the attempted cumulation was punishment unauthorized by law. Article 37.10(b)’s plain language is clear that, when the jury assesses punishment and returns a verdict assessing punishment that is both authorized and unauthorized by law, “the court shall reform the verdict to show the punishment authorized by law and to omit the punishment not authorized by law.” Accordingly, we hold that the judge erred in failing to accept the initial punishment verdicts and omit the jury’s unauthorized attempt to stack the terms of confinement. Judge Alcala and Judge Yeary dissented. Let me make an admission…sometimes we lose at trial. There, I said it. We don’t win every case. Sometimes the evidence is not in our favor. Sometimes the State is able to prove every element of the alleged offense. And we typically know that going into it. It begs the question, “Why take the case to a jury trial if you suspect you are going to lose?” Here’s why…because in many situations, going to trial is the only way to get a good result. For instance, we had a client that was charged with a low level misdemeanor offense. The State was offering a plea bargain of 18 months probation, a $1,250 fine, and numerous classes in exchange for a guilty plea. We considered this offer to be too steep in relation to the alleged offense. Our client agreed. But the State was not willing to budge on the offer. So we set it for trial. After a hard fought trial, the jury came back with a guilty verdict, which is what we suspected all along. Then we went to the judge for punishment. The State continued to recommend 18 months probation and a $1250 fine. The judge, however, awarded our client 2 days of labor detail and a $750 fine. Two short days later, the entire ordeal was but a fleeting memory for our client. No probation. No monthly reporting. No random drug tests. No classes. We would have never received such a low punishment offer from the State. We also would have never received such a low sentence from the judge if we hadn’t gone to trial and filled her in on the extenuating and mitigating circumstances of the case and our client. In criminal defense, a moral victory is still a victory and sometimes you win by losing.